HAVE YOU EVER KNOWN SOMEONE WHO TOUCHED EVERY PART OF YOUR LIFE? Andrew and Melissa’s lifelong correspondence begins as childhood friends exchanging notes and birthday cards. Their bond becomes stronger over the years, even though they are far apart. Andy goes to Yale, Melissa flunks out of college. She marries and he goes off to war. Fall head over heels for A.R. Gurney’s iconic epistolary play Love Letters, the story of a 50-year correspondence between Melissa Gardner and her childhood-friend-turned-lover, Andrew Makepeace Ladd III. 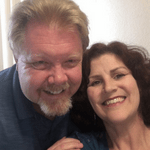 San Diego favorites, real-life husband and wife, Heather and Bill Deerfield bring Melissa and Andrew to live for one night only on the Coronado Playhouse stage. 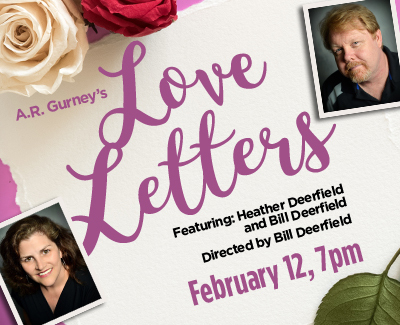 Bill and Heather Deerfield are thrilled to perform Love Letters at Coronado Playhouse. Their most recent Coronado Playhouse collaboration was Sordid Lives. Heather played Latrelle Williamson and Bill was the Assistant Director. They truly enjoy working together, and have performed Love Letters previously at Onstage Playhouse and PowPAC. The Deerfield’s would like to thank the Coronado Playhouse Board of Directors for making this production possible.